Open the database in which you want to locate specific items. Put your cursor over the header at the top of the column you want to filter. Click the down-arrow when it appears and select "Show Filter Choices." Look down the list that appears and click the value you are seeking. In this case, we have selected Mainstreeter to view all the issues of the NPRHA’s quarterly journal. 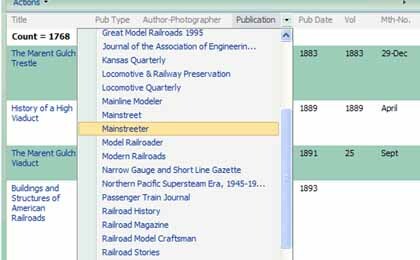 The click results in a table showing all issues of the Mainstreeter. This table can be further Column Filtered to find a particular Title or Issue Number. When you want to change your filter choice, click Show Filter Choices again, select the new item and click "Clear Filter for Item." Column filtering works on both Windows and MAC machines.